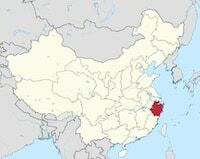 Zhejiang is the province to the south of Jiangsu, and the heart of Jiangnan, the lower Yangzi river area. As noted in my previous post this region is notable for its economic productivity and wealth, which dates back more than 1,000 years, and persists down the present. Like Jiangsu, Zhejiang is outside of the core area of the rise of Han civilization, but by the 1st millennium A.D. became a redoubt of Chinese civilization in the face of non-Chinese incursions into the north. Zhejiang is also the location for one of the major centers of Christianity in China, Wenzhou. On the order of ten percent of this city’s population is Christian.